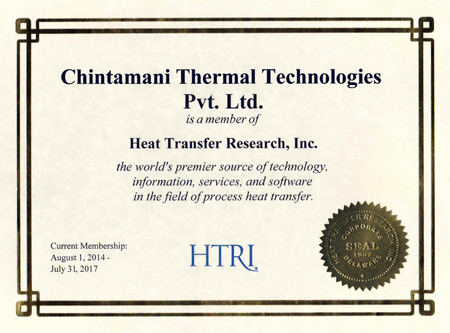 Chintamani Thermal Technologies Pvt. Ltd. Pune established in the year 1993 after a vast working experience in the design of thermal systems with the expert of the field. Over period of time, we have achieved perfections and skills to design and manufacture the heat exchangers of any scale and applications. 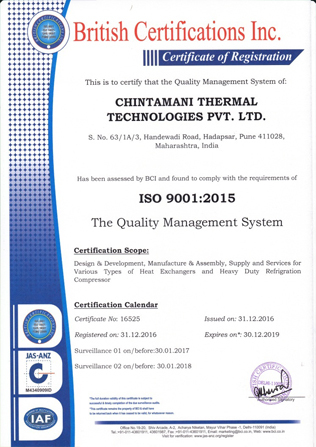 This has helped us to get quality certificate ISO 9001 : 2015 for our expertise in research and development, designing and fabrication of all types of heat exchangers. We also design and manufacture the machineries and components required in the chemical plants. Refrigeration is the art and science of maintaining temperature of the products and conditioned spaces below outside ambient conditions. As per estimation, refrigeration represents up to 60% of the total electrical energy costs in most food and beverage plants! Recently, the refrigeration industry is witnessing the technological changes due to environmental issues and increasing cost of traditional fuel sources. This motivates us to introduce the clean and green practices in the refrigeration plant. Ammonia is considered as 'God's Refrigerant' to reduce carbon dioxide emission of the refrigeration plant; thanks to its best thermo-physical and transport properties. The reciprocating compressor with judicious capacity control techniques and ammonia refrigerant, make simple and impressive choice to save thousands of kilowatts of precious electrical energy. Through the promotion of the pair - Ammonia and Reciprocating Compressor; Chintamani Thermal Technologies Pvt. Ltd. is making a small contribution to these worldwide efforts in promotion of green practices. Office : S. No. 29 / 3A / 2, Behind Gaikwad Hospital, Hadapsar, Pune - 411028., Maharashtra, India. Factory : S. No. 63 / 1A / 3, Handewadi Road, Sasane Nagar, Pune - 411 028., Maharashtra, India. Tel. No. : +91 - 20 - 26970163, 26820908, 26874628, Fax : +91 - 20 - 26970071. Mobile No :- 9923757129, 9923757130.